The world`s most glamorous film festival has started today in the picturesque seaside city of Cannes on the French Riviera. The 71st annual Cannes Film Festival is currently being held from 8th to 19th May 2018. Australian actress Cate Blanchett has been named as the President of the Jury. Asghar Farhadi’s psychological thriller “Everybody Knows#”, starring Spanish duo Javier Bardem and Penélope Cruz opened the festival, as well as competing in the Main Competition section. It will be the second Spanish-language film to open Cannes, following Pedro Almodóvar‘s “Bad Education”, which screened on the opening night of the 2004 festival. The Official festival poster features Jean-Paul Belmondo and Anna Karina from Jean-Luc Godard’s 1965 film Pierrot le Fou. It is the second time festival poster was inspired by Godard’s film after his 1963 film Contempt in 2016 festival. According to festival’s official statement, the poster is inspired by and paid tribute to the work of French photographer Georges Pierre. 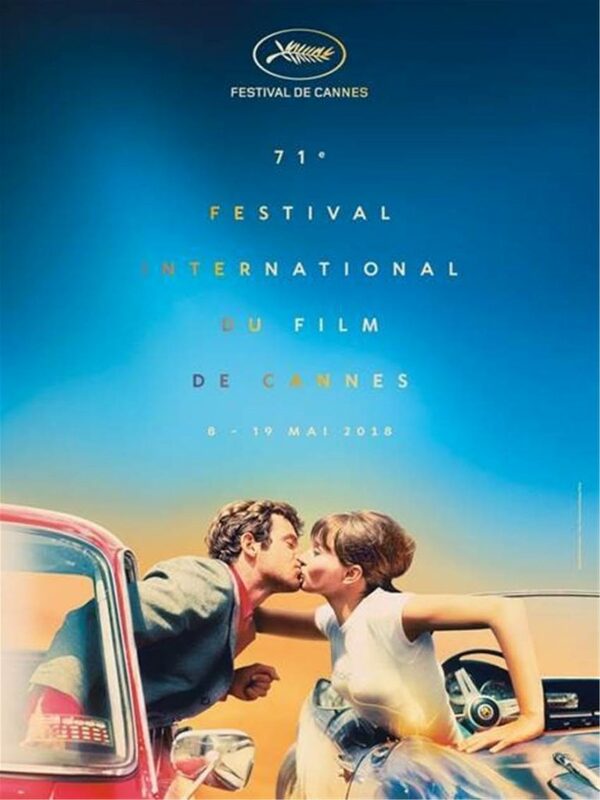 Official poster of the 71st Cannes Film Festival featuring a still of Jean-Paul Belmondo and Anna Karina from Jean-Luc Godard’s 1965 film Pierrot le Fou. Alongside the President of the Jury, Aussie actress Cate Blanchett, this year the Jury members include one of Taiwan’s best-known actors Chang Chen, Kristen Stewart, Khadja Nin, director Ava DuVernay, French writer and producer Robert Guediguian, Lea Seydoux, director Denis Villeneuve and Russian director Andrei Zvyagintsev. Cate Blanchett has defended the lack of female directors at Cannes this year, arguing that change will come to the film festival, but “not overnight”. Speaking at an opening-day press conference for the festival, the Australian actor pointed to the female-majority makeup of this year’s jury – which she heads – and an increase of women on the event’s selection board as evidence of Cannes’ commitment to be more inclusive, but argued that the process of selecting films for the festival should be determined on merit rather than gender parity. 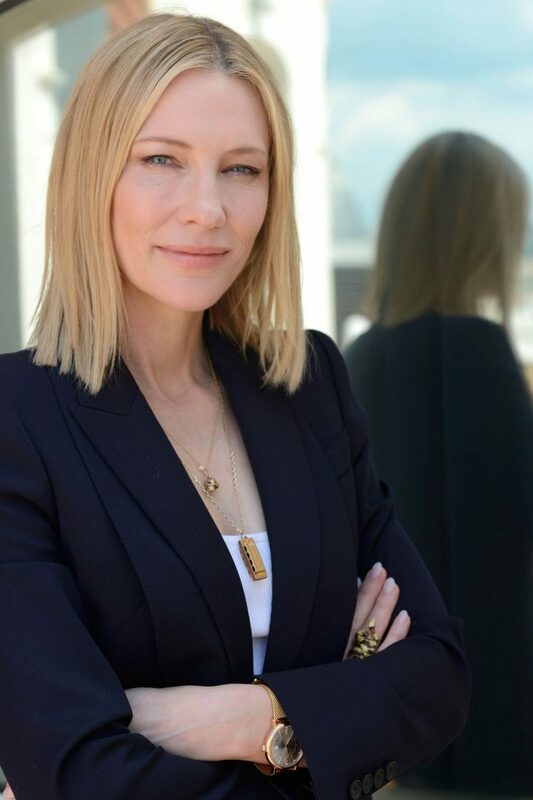 Cate Blanchett at President of the Jury Photoshoot during 71st Cannes Film Festival 05/08/2018. Spanish actress Penelope Cruz looked stunning while walking the red carpet at the 2018 Cannes Film Festival Opening Ceremony held at Palais des Festivals on Tuesday (May 8) in Cannes, France. The 44-year-old actress was joined by her husband Javier Bardem. Penelope and Javier‘s new movie Everybody Knows served as the opening film screening for the festival. The 44-year-old was dressed in Chanel form fitted black gown and completed the look with Atelier Swarovski by Penélope Cruz Fine Jewelry Collectio jewelry. American actress Kristen Stewart posed to the photographers at the 2018 Cannes Film Festival Opening Ceremony held at Palais des Festivals on Tuesday (May 8) in Cannes, France. The 28-year-old was dressed in all black Chanel ruffled dress and jewelry while finishing off the look with Giuseppe Zanotti shoes. She was joined by fellow jury members Ava Duvernay, Lea Seydoux, Khadja Nin, Chang Chen, Robert Guédiguian and Andrey Zvyagintsev. Thai actress Araya A. Hargate was all smiles at the 2018 Cannes Film Festival Opening Ceremony held at Palais des Festivals on Tuesday (May 8) in Cannes, France. The 36-year-old actress looked elegant dressed revealing Zuhair Murad red shimmering gown from Spring 2018 collection. Brazilian fashion blogger Camila Coelho posed to the photographers at the 2018 Cannes Film Festival Opening Ceremony held at Palais des Festivals on Tuesday (May 8) in Cannes, France. The 30-year-old blogger made a stunning debut in a custom Ralph & Russo Haute Couture dress. It featured a fitted black velvet strapless mini dress with an asymmetrical 7-foot silk organza train frill train. The dress took a whopping 500 hours to create, and was shared with Coelho’s 7.1 million Instagram followers.